SUNRISE, Fla. (AP) — Brock Nelson made sure the playoff-bound New York Islanders still control their destiny in the final game of the season. 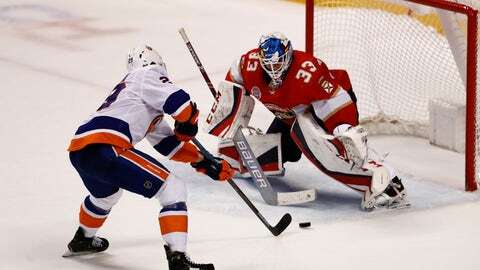 Nelson scored in the second period and then got the winner in the fourth round of the shootout to give the Islanders a 2-1 victory over the Florida Panthers on Thursday night. Thomas Greiss finished with 29 saves through overtime and thwarted all four Florida attempts in the tiebreaker as the Islanders won for the third time in four games. Jonathan Huberdeau scored the tying goal for the Panthers with 7:15 left in the third period. Sam Montembeault had 35 saves in his 10th NHL start. Nelson gave the Islanders a 1-0 lead on his 25th goal of the season, a one-timer from the right circle that got past Montembeault at 1:50 of the second. Huberdeau tied it on the power play as his shot from the slot trickled between Greiss’s pads for his 29th goal and 90th point of the season. NOTES: Huberdeau joined Aleksander Barkov with 90 points this season, the first time the Panthers have had two players reach the plateau in one season. … Panthers G Roberto Luongo turned 40 on Thursday. Luongo is the oldest goalie in the NHL, and third oldest player. … Islanders D Thomas Hickey returned to the lineup after being a healthy scratch the past six games. … Miami Dolphins coach Brian Flores dropped the ceremonial first puck. Islanders: At Washington on Saturday night. Panthers: Host New Jersey on Saturday night.